Chopsticks! Great for smaller, petite cacti that have sharpies. Who knew that that collection of chopsticks in the kitchen drawer from all that takeout would come in handy in the garden. Cant use chopsticks? Tongs are just as great. Especially the ones covered in rubber. The rubber softens your grip on the cactus and mimimises damage. Mini tongs are useful for smaller cacti the larger ones for medium sized cacti. Use carpet for the big fellas. Same concept as the newspaper, just on a larger scale. Wrap the carpet around the trunk, and you can gently hug and lift them into position. 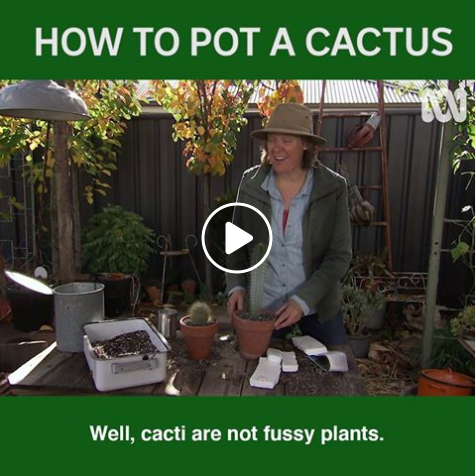 Thank you Millie and the team at Gardening Australia for the great video!